Newport County extended their lead at the top of the Blue Square Bet Premier to five points as Ismail Yakubu's goal secured victory against Ebbsfleet. Yakubu scored his fifth goal of the season with a downward header from an Andy Sandell corner on 30 minutes. Aaron O'Connor saw an effort cleared off the line during a second half which the visitors controlled. 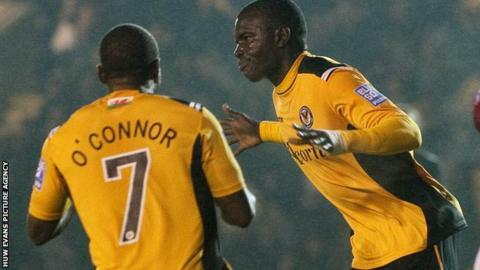 But Newport's defence held firm to maintain their unbeaten record at Rodney Parade. The win was Newport's fifth in six games and they are now five points clear of second-placed Forest Green, who lost 2-1 at home against Tamworth. "I was fully aware how of tough this game would be. I think you've got to give praise to the opposition - they're fighting for their lives. "It was tough. We had to grind it out and there's going to be some more of those throughout the season. "With results going in our favour it would have been disappointed if we hadn't taken the opportunity, especially being at home." "We're obviously struggling at the bottom and Newport are flying, but anybody who came here would have seen there wasn't that big a gap. "We had enough possession and chances and we haven't converted them into goals, and that's cost us. "We dominated against a top-of-the-table side but we've got to get that cutting edge. You've got to turn possession into goals. "In between both boxes it's level but in the box is where it matters."